Antique brass continues to be one of the most popular finishes of stair rods available, regardless of fashion, home décor trends or the passing of time. Mellow in tone compared to the brighter, polished brass options, antique brass looks the part in both period and contemporary styled homes on both plain and patterned stair runners and can be matched to other decorative items such as light fittings and door handles. If you are looking for antique brass stair rods, first find the design style you prefer and then select the relevant finish in the shopping basket. What is antique brass and how to maintain the look? Most of the ranges of stair rods we are offer are manufactured in a hollow rod version, which are both robust and high quality in finish. However, the Premier brass stair rods have a solid brass core construction and reflects the traditional way of making high quality stairrods, which dates back centuries. Whichever the production process, the antique brass rods are then antiqued and finished. Unprotected or unlacquered brass will naturally tarnish, particularly in certain atmospheric conditions, such as moisture in the air. The effect can be inconsistent and not particularly attractive, which is why our stair rods are aged intentionally, under controlled conditions. In this way we ensure an attractive and professional antique brass finish. The stair rods are then protected with an invisible lacquer to make the finish permanent and stable; this avoids the needs for serious brass polishing, simply give them a quick wipe down with a damp cloth. In fact, there are over 30 individual designs to cater for everyone’s taste. The Victorian Stair Clip is likewise sold in an antique brass finish, providing an alternative, period option. There is a choice of plain, spiral or reeded rod in the Vision, Country, Crystal and Eastern Promise range of stair rods. These are all sold in ten different finishes, including antique brass. Our other ranges are available in a plain style of rod only. It is sometimes possible to find old stair rods at salvage yards, which date back to the early 19th century. Typically, these are full of character being dented and bent. If not too severely marked, it is sometimes possible to polish up these old carpet rods, back to the original, shiny brass finish. However, depending on the atmospheric conditions where they are fitted, they will once again become tarnished over time. For anyone who lives near the sea, you will know the combination of salt and moisture is particularly conducive to tarnishing brass. If you do decide to fit your antique stair rods, then be careful to protect your carpet when cleaning the rods. 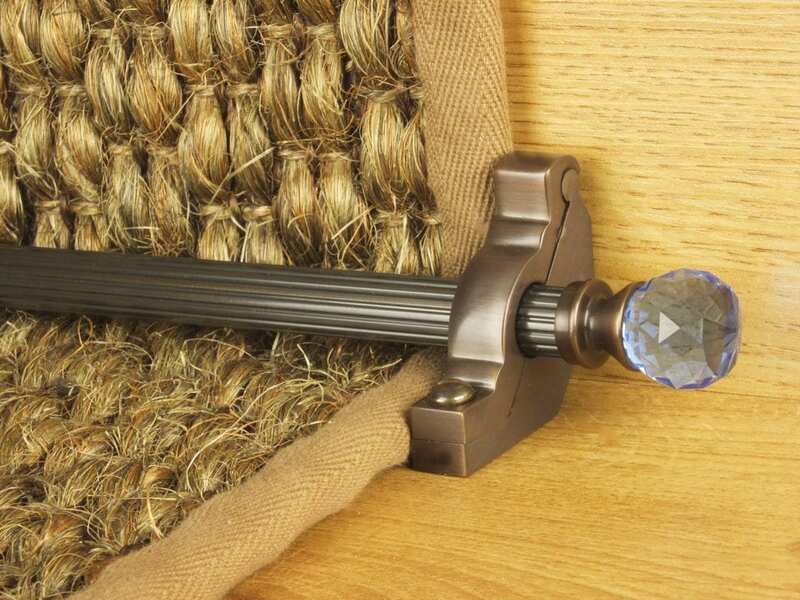 Likewise, salvage carpet rods rarely come complete with brackets, which is why we offer replacement brackets for sale in all finishes, for both cylindrical and triangular shaped rods. If the look of an old brass stair rod appeals but not the work or care involved, then do take a look at the antique brass finish available in the ranges we offer today. Satin brass and antique bronze may also work well with a period style of décor.